Where a simple, mystifying dream of a dazzlingly opulent city becomes an obsession that leads to a labyrinthine world of nightmare . . .
Where the fantasies of youth are replaced by realities that unlock the past and haunt a future that has already been lived . . .
Where the answer to a macabre disappearance comes to the ears of the living through the words of the forever undead . . . 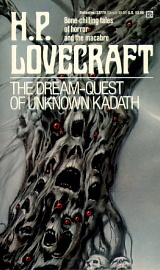 The Dream-Quest of Unknown Kadath. By H.P. Lovecraft. New York, NY: Ballantine Books; 1970; ISBN 0-345-33779-4, Paperback.